Then my latest project, the embroidered tunic. son-in-laws and grandchildren, changes in jobs and a new sewing room! I am so grateful for the opportunities that sewing and my blog have given me. I feel so blessed to be part of the online sewing community and I want to say thank you. Thank you for following my blog and my instagram, thank you for leaving such incredible comments and sending such sweet emails. I am going to give a $25 to Style Maker Fabrics. Just leave a comment about anything and I will draw on Monday, the 28th . Entries will close at 8 PM Central Time on the 27th. Congratulations! Happy Anniversary! Your blog is one of my favorites. Wow, 11 years? That's so impressive - and you still bring as much joy and passion to sewing and blogging as any newcomer! Happy Blogversary Lori! I have enjoyed your journey for a long time now. Thank you! Happy Anniversary of your blog! Your's is one of my favs! That's a long tine. Do you know how many post and words you have posted? Here's to 11 more. Congrats on the anniversary. And I can see why you still love that jacket, it's awesome! I have followed for at least 6 years, even listened to the podcast. You talked about one of the girls playing softball and having a wide back. You made her a jacket and added room in the shoulder area. This was an ah ha moment for me. Love the blog. You are so talented. Congratulations on your blog anniversary! So many helpful tips and ideas. Thank you for the chance to win the gift card, too. I like seeing your first garment and the latest. I think we starting blogging around the same. I visit your blog often to see your new creations. Your tunic looks great! I have not embroidered much in several years, seeing more of this creativity of late. Need to pull out some of my embroidery designs to try again. Happy 11 year Blogiversary! I'm so glad I discovered you thes last few months. I've enjoyed following here and on IG. Here's to 11 more! Happy Blog Anniversary!!! I enjoy reading and seeing all your makes on your blog! 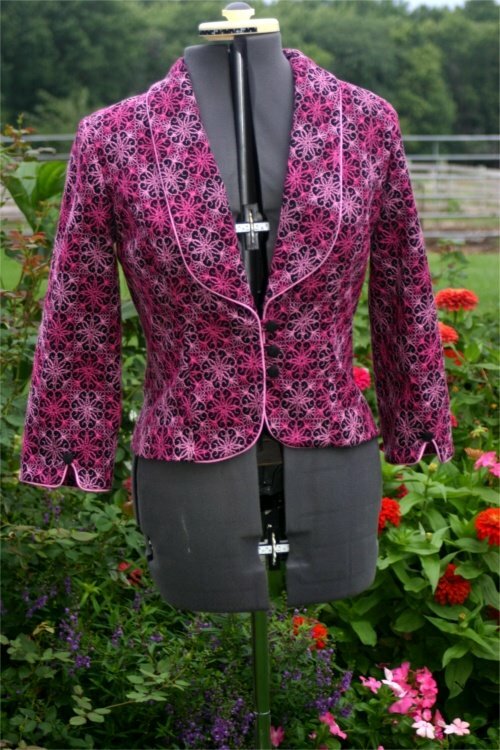 It has opened my eyes up to the wonderful world of indie patterns!! Happy Anniversary Lori! I've been with you a long time, tho I rarely comment anymore as I read blogs on the go. You're always an inspiration to me so I hope you keep blogging! Your blog is always so inspiring to me and was one of the first ones I started following. Your style and garments always seemed to be some of the same projects I was contemplating. I love this online community and thank you for the inspiration you provide. Congratulations! That jacket is gorgeous. Happy Anniversary! Really enjoy your blog! Happy Anniversary, Lori. Your blog was among the first I followed when I returned to sewing about 6 years ago. I like that we are close to the same age and enjoy wearing the same sort of garments. You provide me with lots of inspiration! Congratulations! I started my blog (eldidalaldit.blogspot.com) on the first of January 2017, I'm still on my first year! I love to read your blog, both about the sewing and also about life in America, thank you for sharing so much about yourself! I am the mother of two teenage daughters having a bit of a difficult time, it is inspiring to read about women with older daughters, something to look forward to! Lori, Congratulations on you 11th blog anniversary......time really flys! Love your new sewing studio! I dream of a sewing studio, very much like your! How fortunate we all are that you're just sewing and blogging away :-) Congrats on 11 great years. Happy Anniversary! I came late to the party but have enjoyed following you for the time I have. I love your style, it suits you and well, me! May you continue to blog for many years and continue to sew always. I love your blog and seeing your creativity in everything you make! Lori a big CONGRATULATIONS to you! Wow congratulations. Your first make is still so current. thanks for blogging all this time. I enjoy following along. May the next 11 be just as wonderful. Congratulations. I love your selection of pattern and the fabrics you choose. Keep up the great blog. That's great that you still enjoy blogging Lori, even after 11 years, when so many other bloggers have disappeared for one reason and another. Congratulations! Hi Lori, you must have been one of the first sewing bloggers. I always enjoy reading your articles and love seeing your cute dog in your photo's. I love that your girls model your makes for them too. Keep up the great work. Happy 11th Anniversary! I enjoy your blog so much! Your creations are stunning. Good for you for being so dedicated to blogging. It is definitely a commitment! I just discovered your blog this year and have enjoyed reading about all your sewing projects. Happy Anniversary. I always enjoys your posts about your daughters. Happy Blogiversery! I enjoy your blog & look forward to seeing what you've sewn. You're very talented. I enjoy your garment creations, your quilts and your garden. Congratulations! Congratulations. I love what you make. Both fashion and your quilts. Congrats on 11 years! I love your blog! Congratulations! You are a sweet presence in the sewing community. I have enjoyed your blog and podcast. Happy Blogiversary! I really enjoy reading your posts - there is always something new and different. 11 years is amazing! I loved your post today about how much you have enjoyed the blogging community. I have enjoyed your blog for a few years now. You are the most prolific dressmaker I know, and I love your style! Love your blog and style! Happy 11th anniversary - hope there are many more years of Girls in the Garden! Congratulations ! Not many people make it this far. I appreciate your blog and anyone else who does because I have really noticed that when I check on my blog list on a regular basis there really are not as many new blog posts going on and although I love Instagram I prefer more meaty information on a garment. I love your modern , fresh , colourful style and it has been great to see you become a grandmother too ! Congratulations again and here's to another 11 years ! Happy blog anniversary! I always enjoy your blog and seeing what you make. You are very inspiring! Congratulations, Lori! You have inspired so many of us! Happy Anniversary Lori. You are an inspiration...always posting something lovely. Your work is always top notch. Congratulations, Lori! I've followed your blog for years and really enjoy it! Congratulations, Lori! Your blog is amazing, and I love seeing everything you make. Thanks for taking the time to share it with us! I may have been following you since the beginning! I always love seeing your garments. You manage to get so much done. Congratulations!! Congratulations! I'm a relative newcomer to your blog (following for about a year now) and throughly enjoy being involved in your projects. Happy Blogversary! I've been following you for years because I love the diversity of your sewing. I have been following for years. Just last week I listened to several of your podcasts again! You have been a wealth of information and I love reading your posts. Thank you for sharing and your authenticity. congrats for the blogversary and I am always amazed at how much you get done! Congratulations! I only recently discovered your blog, and it is one of my favorites! Your makes are all great. That jacket from your 1st post is amazing - and haha @ the horrified teen face!! I don't take the time to comment very often, but I draw a lot of inspiration from your posts! Happy Blog-o-versary! Time flies by so quickly! 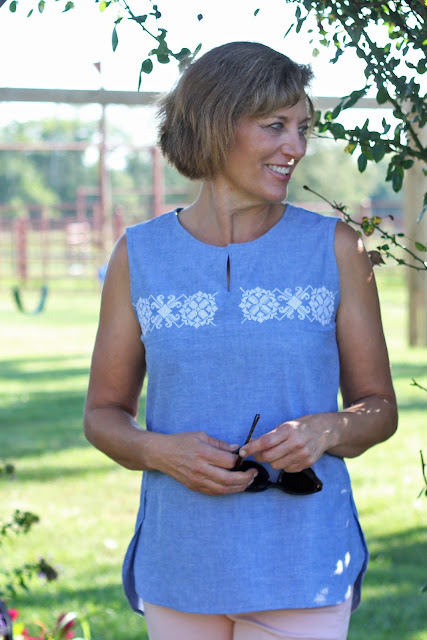 I'm sure crushing on your embroidered tunic --- so summery & cool! Thank you for continuing to blog. Your posts inspire me, and I am frequently in awe of your level of productivity! Congrats on your blogiversary. and thanks for having the giveaway. Congratulations on your 11 years of blogging! I only have been following you for the past year or two but I love everything you make. Thanks for sharing your beautiful creations! Congratulations! I'm impressed with your stamina, considering the richness of your life. Congratulations! Such an amazing achievement. Thanks so much for all the inspiration. Congratulations on your blogging anniversary! Well done! Congratulations Lori! Your blog is a favorite of mine, simply because you are so down to earth and sew garments that are beautiful, yet things I would wear in my life, too. I wonder how you make time to do it all! Thanks for all the inspiration! Love your blue embroidered top!